For several million years the Earth has experienced regular galciations followed by shorter warmer periods roughly every 100,000 years. What causes this seemingly regular climate oscillation ? The textbook answer is that they are initiated by changes in the Earth’s orbit and axis tilt called Milankowitch cycles and are then enhanced by a CO2 feedback effect. However the details are complex. For the last 1 million years Ice ages have occurred more or less every 100,000 years which corresponds to the change in eccentricity of the Earth’s orbit around the sun. Looking at the detailed effects on changes to incident solar radiation we find . 1. A 41,000 year variation in the tilt of the Earth’s axis to the sun. This effects the severity of winters and summers during the year. 2. A 23,000 year precession of the same axis of rotation which changes the season within the year. 13,000 years ago Winter in the Northern hemispheer was in June. 3. A 100,000 year oscillaton in the elipticity of the Earth’s orbit around the sun. Most important is the change in elipticity of the Earth’s orbit which changes the distance from the Sun during the year. So when winter in the northern hemisheper corresponds to a large distince from the sun we can expect more severe cold winters. The evidence from ocean sediment samples from around the world show at least two phases in glaciations over the last 5 million years (figure 1). There has been an overall long term cooling in temperatures which then enters first an oscillation with a period of around 41,000 yeras and then later a second modern series of Ice Age oscillations with a period of 100,000 years. The conclusion seems to be that until about 1 million years ago the climate was driven by the changes in tilt of the Earth between 21.5 degrees and 24.5 degrees with a period of 41,000 years. A larger tilt changes the solar insolation in summer and winter by essentially extending the arctic circle and the extent of the tropics, thereby exaggerating the seasons (see figure below). However for the last 1 million years there have been about 10 regular glaciations with a time period of 100,000 years corresponding to the change in elipticity of the Earth’s orbit. Currently the eccentricity is 0.025 which causes the southern hemisphere summer to receive about 6% more solar radiation than the Northern Hemisphere summer. This also means that the Northern hemisphere winter receives 6% more solar radiation than the southern hemisphere winter. In about 13,000 years time balance this will be reversed because of the precession of the Earth’s axis. Then Northern winters will then be more severe. One would expect that the largest effects on insolation for large latitudes would be the 41,000 year change in tilt of the Earth’s axis and this seems to have been the case up until 1 million years ago. No-one really understands why this happened. The change in eccentricity of the the Earth’s orbit around the sun have been larger in the past, but currently we seem to be in a quiescent phase. There is also a secondary longer ~ 400,000 year cycle in the intensity of the orbit eccentricity. The eccentricity of the orbit is e =(a-p)/(a+p) where a is the Aphelian (largest distance) and p is the Perihelion (shortest distance). For a circluar orbit a=p=R. Currently e=0.012 but has in the past been as high as 0.65 causing a 20% change in total solar radiation between Aphelian and Perihelion. The traditional model of how Ice Ages develop is that cooler summers in the Northern hemisphere lead to less summer melting of winter ice which slowly building up ice coverage. This is then accentuated because the albedo for ice is large thereby reducing further the absorbed solar energy – a positive cooling feedback. In addition cooler oceans dissolve more CO2 and colder temperatures reduces water vapor which all reduce further greenhouse warming – more positive cooling feedback. Therefore one would expect to see a correlation between solar insolation at high latitudes and the occurance of glaciations. I do not find this correlation (see figure left) at all convincing. For instance it does not explain why each glaciation seems to last in total 100,000 years or why the interglacial periods are then so short. Sometimes large swings in summer heating produce little or no effect. Instead what seems to be a simpler correlation is that between the occurance of interglacial warm periods with the eccentricity. Strangely enough the correlation is that warm periods occur when eccentricity is highest giving greater extremes of global heating and cooling within a single year. This could mean that a climate oscillation is driven by the change in eccentricity in some way. There must be more to Ice Ages than just Milankowitz cycles Why did the Earth seemingly cool over the last 5 million years? Some theories have been proposed as to just why this unstable climate occurred. 1. Antarctica. Antarctica drifted to the south pole position about 50 million years. Continents build up ice over the winter because the surface cools much quicker than water. Continents also block the transfer of heat through the oceans from the tropics to the poles. Currently the Earth has a nearly land locked arctic ocean with relatively narrow connections to the Pacific and Atlantic Oceans. Siberia and Canada land masses close in much of the ocean. In the southern hemisphere Antarctica sits on top of the south pole blocking off the warming effects of ocean currents. This closing of the thermal isolation at the poles has been proposed as a possible cause of the gradual cooling over the last 50 million years which lead to regular Ice Ages from about 3 millions years ago. 2. The closing of the Panama Isthmus. It is estimated that closure of tropical circulation between the Atlantic and Pacific Oceans by the creation of the Panama Isthmus by continental drift occurred 3 million years ago. This then produced the North Atlantic Gulf stream. It has been been proposed that more moisture in northern latitudes may have enhanced glaciation . 3. Collision of India with Asia. The collision of India with Asia following the breakup of Pangea begun about 50 million years ago creating the Himalayas and the world’s highest plateau in Tibet. In 5 million years the himalayas could have risen by 5-10,000 meters . It has been suggested that suc alarge area in the tropics covered in Ice has lowered the Earth’s albedo which led to global cooling and the on-set of the Ice Ages. 4. Climate oscillation. One idea that has been proposed is that clouds are the Earth’s natural thermostat. A warm climate produces more cloudy increasing the albedo which cools the planet. This is the same idea as that described in Water World. It is proposed that the presence of a large continent (Antarctica) over the south pole together with a land locked Arctic Ocean has propelled this natural thermostat into oscillation . 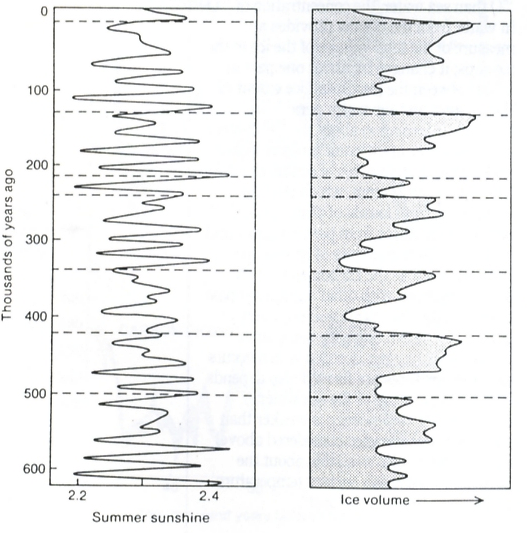 Milankowitz proposed that Ice Ages are caused by a lowering of solar insolation at high northern latitudes in summer months. This then supposedly led to less melting of the previous winter’s ice slowly leading to an extension of glaiciers, aided by positive Ice albedo feedback. This is still the accepted cocensus, however there is no real evidence in the data to support it. Despite over a hundred years of effort there is still no complete understanding of the causes and evolution of Ice Ages. An excellent review is given by M.E. Raymo and P. Huybers . Milankowitz 100,000 and 41,000 cycles are clearly visible in the data and must play a significant role, but there is no firm evidence they are the only driver or even the main driver. 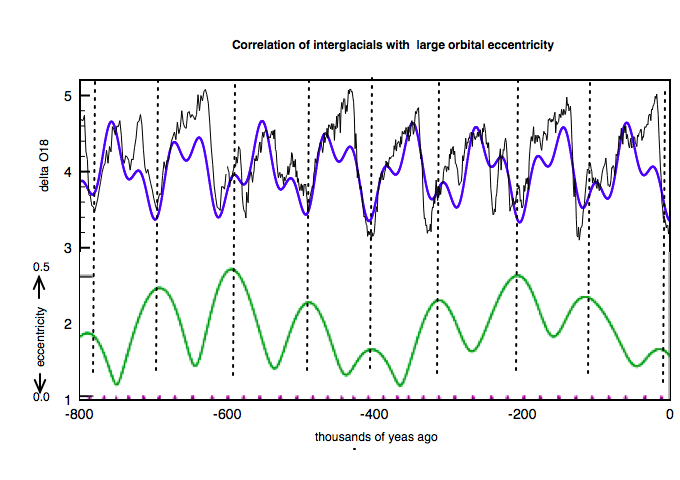 For the last 900,000 years interglacial periods have coincided with larger eccentricities (e) of the Earth’s orbit as is shown below, for which, as far as I am aware of, there is no coherent explanation. Ocean sediment data compared to orbital eccentricity. The blue curve is a parameterized fit described in the next post. 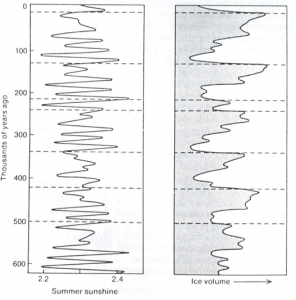 The most complete paleoclimate data covering the ice ages are available from ref . 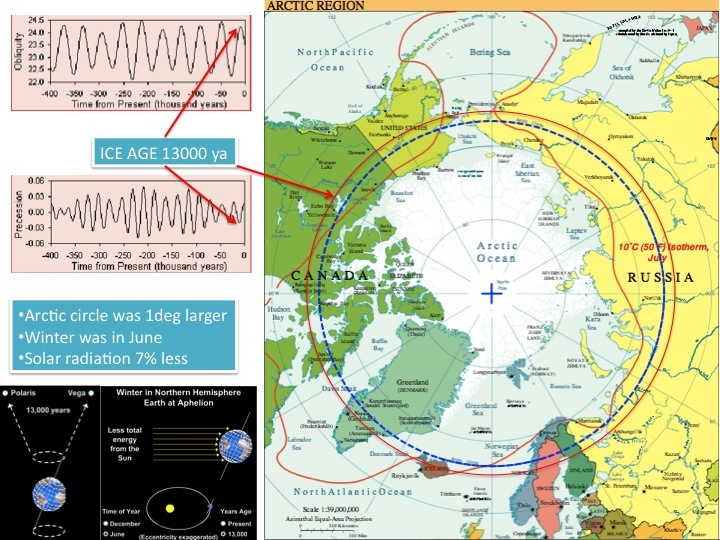 In the next post a phenomenological analysis of this data is presented which attempts to identify the signal components within the data and tries also to predict when the next Ice Age will occur. This entry was posted in Climate Change, Gaia and tagged Climate Change, Ice Ages. Bookmark the permalink. Dear sir i love your work. I have looked at the data from the vostok ice and the other samples and they also show dust levels.and its seems to correlate. What is your opinion on that data. Thank you and best regards Hugo.